1988-July: Replicants was founded when the three groups A-Team, HOFA and Shogun joined forces. They wanted to form the best cracking group on the Atari ST. The name "Replicants" has been suggested by Ninja/Shogun. Their first release was an intro called Bloody and Bluedy. 1988-September: They were asked by ES/TEX to join the Union and so they did. 1988-Oct: They organized The Replicants Copy Party. 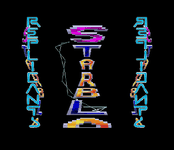 1990-July: They organized the Marseille Replicants Party in the beginning of July and the Replicants/NeXT Summer Convention at the end of the month together with NeXT. 1992-May: Amazine 1 reports that Bad Boys Belgium joined the Replicants. 1992-July: Orion joins the group. 1992-Sep: Mr. Bug got kicked. 1992-Nov: Amazine 3 reports that Misterbug joined as a Cracker/Coder. 1993-Aug-3: Ellfire and Orion leaving the cracking scene. Member-status on The Ancient Art Of War In The Skies Cracktro: Celtik, Cameo, Jack, Spikey and Little Guy. There were plans to start cracking on the Super Nintendo but Ellfire got busted before they could even start. 1993-Sep-7: They released their last cracks. 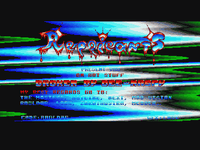 During their existance the Replicants cracked about 800 titles for the Atari ST.